To the south of Kraków’s medieval Old Town, nestled between the popular student district of Podgórze across the Vistula, and the Wawel Castle hill on its northern fringes, the city’s historical Jewish quarter is an area with a rich history, at once both infamous and enthralling, now oozing with the bohemian, beatnik charm of quirky cafes and local beer basements. In the past decades the area has become a favourite haunt for locals, where the tourist crowds are somewhat smaller and the music joints are considerably more alternative. To take a walk through Kazimierz is to journey through the very interfaces of the old and the new in Kraków, where the post-war scars of the city’s darker history, now melds into an enchanting picture of a delightfully vibrant centre of coffee and cuisine and jazz. The area was first incorporated into Kraków’s city limits in the 14th century, by the eponymous King Kazimierz Wielki (that’s King Casimir the Great to you and me), who had also granted unprecedented rights to Jewish settlers in the area, making the district popular among followers of the religion who had suffered persecution elsewhere in Eastern Europe. For several centuries after Casimir declared Jewish freedom of worship here, the Jews of Kazimierz thrived, giving the area a unique style and character that endures to this day. On the northwest side of the district, restaurants cook up traditional Jewish dishes on either side of the wide, cobbled Szeroka Street. At its end, the white gables and red, square cut ridges of Poland’s oldest synagogue, the aptly named Old Synagogue, stand as a defiant and enduring symbol of Jewish culture in Kraków, after being decimated during the Nazi occupation in World War II. The Old Synagogue dates right back from the 15th century, making it a particularly apt site for what is now the museum of Kraków’s Jewish cultural history. At the centre of Kazimierz can be found the beating heart of the district, the unassuming, petit market square of Plac Nowy. This roughly tarmacked square is proudly dishevelled, and host to ramshackle of quirky bazaars in the summer, where tourists can buy anything from antique telephones to communist memorabilia. On its fringes, some of the city’s most popular beer basements are always crowded with locals, but the real pull are the Zapiekanki stalls that teem with meandering queues all day long – they are rumoured to be the best in Poland after all! 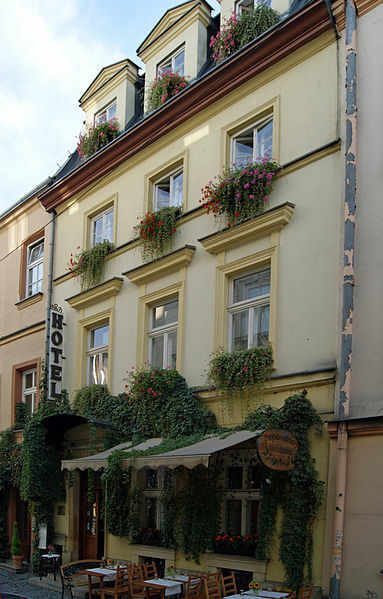 Coming off the central square, halfway down Beera Meiselsa Street and next to one of the many garden bars that are so characteristic of the area, visitors can stand in one of the spots once used by Steven Spielberg in his World War Two epic, Schindler’s List. Today, a framed picture of the film crew hangs from the ivy-covered wall that can be spied in the scene itself. Kazimierz is also home to the magnificent Corpus Christi Church, with its spire-clad, gothic façade and elaborate baroque interior decorations. What’s more, with a foot path and none of the crowds that colonise the banks under the Wawel in the summer, the thin path that separates Kazimierz from the Vistula River on its south side can be a great place to sit and digest the, often overwhelming, historical merits of this beautiful district.